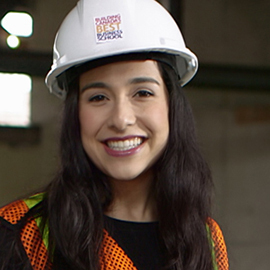 Join Shadi Varkiani, a third-year Laurier Economics student, as she tours the construction site of the new home of the School of Business and Economics and Department of Mathematics and learn about a unique opportunity to put your name on the GIE by watching our “We Saved You A Seat” video. The overall goal of the campaign is to fundraise $55 million. Donations will support the GIE building, student scholarships, international initiatives, professorships and chairs, entrepreneurship, the Startup Fund, the Department of Mathematics and the McGrath Centre for Excellence in Business Education. This is the first phase of a comprehensive fundraising initiative for the entire university. Over the summer, representatives from Development and Alumni Relations worked with departments across the university to determine the fundraising priorities that will drive the second pan-university phase of the campaign. The first phase of the campaign has already received significant support from individuals, corporations and foundations. As the construction of this game-changing building continues, Laurier has saved its donors a front-row seat. Watch the video or visit www.CanadasBestBusinessSchool.com/NameYourSeat to learn about this unique opportunity to make a permanent mark at Laurier while supporting an exciting new future for Laurier students. For more information, contact Maeve Strathy (’09), development officer, annual giving, at mstrathy@wlu.ca or 519.884.0710 x4683.